"mix&match" in drop down menu. 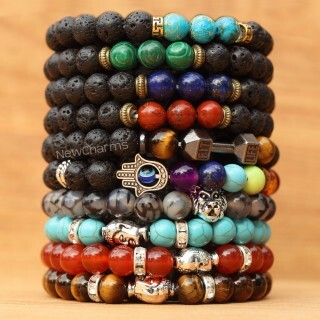 Our new rock bracelets feature beautiful stones and charms at incredible pricing. Made from natural stones, our bracelets offer the unique texture of lava rock contrasted with brilliantly shiny polished stones. The vibrant colors and patterns feature deep and vibrant colors like cat eye stones and aqua colors. See our featured items below. Compare at $20 to $89 online. Working directly with us will save you significantly over retail pricing whether you buy at our low individual pricing or our deeply discounted quantity pricing.